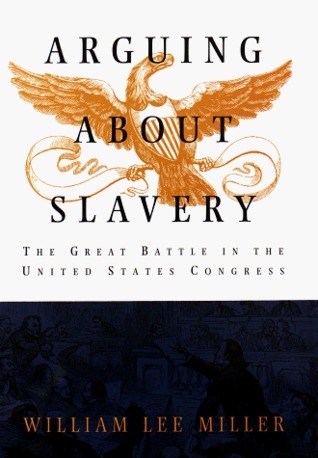 Sign into Goodreads to see if any of your friends have read Arguing about Slavery. 2.6% "It is a revealing curiosity of American popular attitudes that a people so practical, so optimistic, so energetic, so direct, so quick to say that anything can be done by an effort of will--the impossible takes a little longer--on other topics, have regularly and abruptly turned to the opposite extreme on issues of slavery and race: nothing can be done. Leave it alone. Don't meddle. It cannot be fixed." 50.95% "A "wooden nutmeg"--Yankee peddlers developed a reputation for selling fake nutmegs made of carved wood." 52.86% "The great Protestant denominations were being altered in mind and conscience in the North such that very soon the Methodists and the Presbyterians would split apart into Northern and Southern branches, largely over slavery, not to be reunited for more than a century."